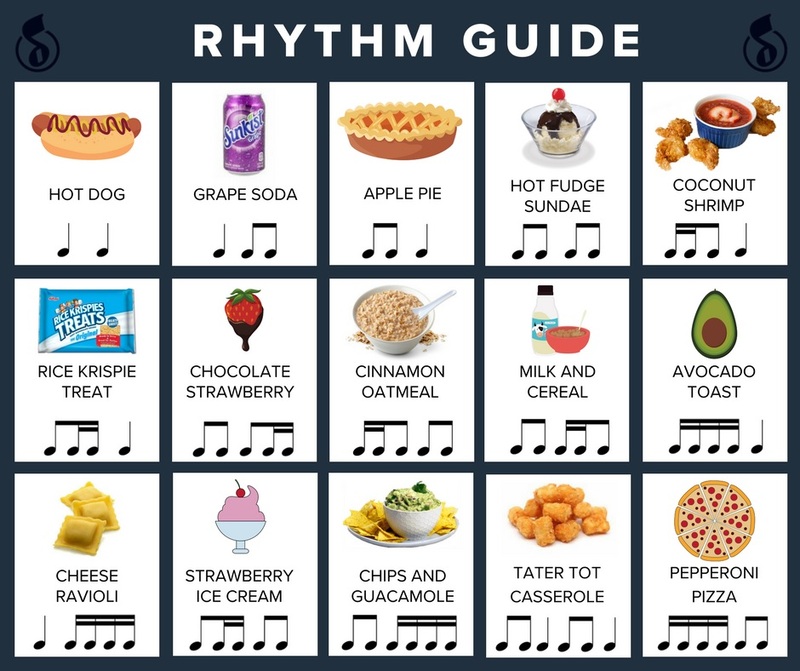 Are you HUNGRY for RHYTHM? "A strong, regular, repeated pattern of movement or sound." "The arrangement of sounds as they move through time." from the Greek, "rhyth-mos": "any regular recurring motion, symmetry"
"Pulses caused in music by the occurrence of strong and weak, and/or short and long." "Grape Soda", "Grape Soda","Grape Soda","Grape Soda","Grape Soda","Grape Soda", etc. "Tater Tot Casserole, Pepperoni Pizza, Milk and Cereal, Avocado Toast"
See? You CAN read rhythms! "[...] marked by the regulated succession of opposite elements, e.g. : the dynamics [*volume changes] of the strong and weak beat: the played beat and the inaudible but implied rest beat, the long note and the short note. "The alternation of the strong and weak beat is fundamental to the ancient language of poetry, dance and music. The common poetic term "foot" refers, as in dance, to the lifting and tapping of the foot in time. In a similar way musicians speak of an upbeat and a downbeat and of the "on" and "off" beat." As we can hear, rhythm all by itself can generate interest and emotion. There is more to this, but the material we've just covered should give you a good start.